8 ¾ x 6 ½ in. 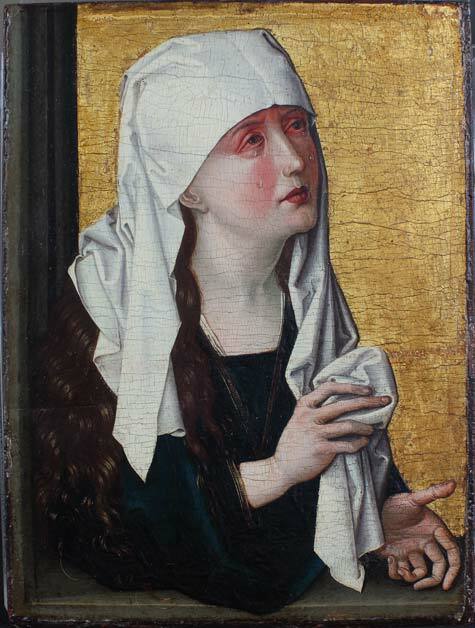 This painting is one of only six known works attributed to the anonymous artist, whose identity comes from his association with the Stötteritz Altarpiece, a triptych located in the church at Leipzig-Stötteritz in Germany. His work, including this Mother of Sorrows, exemplifies the heightened realism and emotional drama that characterized Northern Renaissance painting. With painstaking acuity, the artist has articulated the expressive details of the Madonna's features, costume, and gesture. Her sorrow is explicitly revealed in her red swollen eyes and the tears that fall upon her cheeks. The Madonna extends her left hand out to the viewer in a gesture of intercession, welcoming the prayers of the faithful. This panel was the left half of a portable hinged diptych designed for personal devotion. Traditionally, the subject of the grieving Madonna was paired with an image of Christ as the Man of Sorrows. Mary's gesture of grasping her mantle can be interpreted as a prelude to wiping the brow of the suffering Christ in the missing panel. The window ledge in the foreground enhances the sense of three-dimensional space, an artistic technique perfected during the Renaissance, whereas the flat, gilded background hearkens back to more archaic medieval traditions.